Systemic blood pressure is determined, in part, by arterial smooth muscle cells (myocytes). Several Transient Receptor Potential (TRP) channels are proposed to be expressed in arterial myocytes, but it is unclear if these proteins control physiological blood pressure and contribute to hypertension in vivo. We generated the first inducible, smooth muscle-specific knockout mice for a TRP channel, namely for PKD2 (TRPP1), to investigate arterial myocyte and blood pressure regulation by this protein. Using this model, we show that intravascular pressure and α1-adrenoceptors activate PKD2 channels in arterial myocytes of different systemic organs. PKD2 channel activation in arterial myocytes leads to an inward Na+ current, membrane depolarization and vasoconstriction. Inducible, smooth muscle cell-specific PKD2 knockout lowers both physiological blood pressure and hypertension and prevents pathological arterial remodeling during hypertension. Thus, arterial myocyte PKD2 controls systemic blood pressure and targeting this TRP channel reduces high blood pressure. Systemic blood pressure is controlled by total peripheral resistance, which is determined by the diameter of small arteries and arterioles. Arterial smooth muscle cell (myocyte) contraction reduces luminal diameter, leading to an increase in systemic blood pressure, whereas relaxation results in vasodilation that decreases blood pressure. Membrane potential is a primary determinant of arterial contractility (Nelson et al., 1990). Depolarization activates myocyte voltage-dependent calcium (Ca2+) channels (CaV), leading to an increase in intracellular Ca2+ concentration [Ca2+]i and vasoconstriction. In contrast, hyperpolarization reduces [Ca2+]i, resulting in vasodilation (Nelson et al., 1990). In vitro studies have identified several different types of ion channel that regulate the membrane potential and contractility of arterial myocytes, but whether many of these ion channels regulate systemic blood pressure is unclear. Given that hypertension is associated with altered arterial contractility, myocyte ion channels that contribute to high blood pressure are also important to determine. Transient Receptor Potential (TRP) channels constitute a family of ~28 proteins that are subdivided into six different classes, including polycystin (TRPP), canonical (TRPC), vanilloid (TRPV), ankyrin (TRPA), and melastatin (TRPM) (Earley and Brayden, 2015). Experiments performed using cultured and non-cultured cells and whole arteries, which contain multiple different cell types, have suggested that approximately thirteen different TRP channels may be expressed in arterial myocytes, including PKD2 (also termed TRPP1), TRPC1, TRPC3-6, TRPV1-4, TRPA1, TRPM4 and TRPM8 (Earley and Brayden, 2015). In many of these studies, TRP channel expression was reported in myocytes of vasculature that does not control systemic blood pressure, including conduit vessels, cerebral arteries, portal vein and pulmonary arteries (Earley and Brayden, 2015). Blood pressure measurements in constitutive, global TRPC6, TRPM4 and TRPV4 channel knockout mice produced inconsistent results or generated complex findings that were associated with compensatory mechanisms (Mathar et al., 2010; Dietrich et al., 2005; Nishijima et al., 2014; Earley et al., 2009). Thus, the contribution of arterial myocyte TRP channels to physiological systemic blood pressure and pathological changes in blood pressure are unclear. Also uncertain is whether TRP channel subtypes present in arterial myocytes of different organs are similarly regulated by physiological stimuli and if such modulation leads to the same functional outcome. PKD2 is a six transmembrane domain protein with cytoplasmic N and C termini (Shen et al., 2016). PKD2 is expressed in myocytes of rat and human cerebral arteries, mouse and human mesenteric arteries and in porcine whole aorta (Griffin et al., 1997; Torres et al., 2001; Narayanan et al., 2013). RNAi-mediated knockdown of PKD2 inhibited pressure-induced vasoconstriction (myogenic tone) in cerebral arteries (Narayanan et al., 2013; Sharif-Naeini et al., 2009). In global, constitutive PKD2+/- mice, an increase in actin and myosin expression lead to larger phenylephrine-induced contractions in aorta and mesenteric arteries (Qian et al., 2007; Du et al., 2010). It has also been proposed that arterial myocyte PKD2 channels inhibit myogenic tone in mesenteric arteries (Sharif-Naeini et al., 2009). Thus, in vitro studies have generated variable findings regarding physiological functions of arterial myocyte PKD2 channels. Here, we generated an inducible, myocyte-specific PKD2 knockout mouse to investigate blood pressure regulation by this TRP channel. We show that inducible and cell-specific PKD2 channel knockout in myocytes reduces systemic blood pressure. We demonstrate that intravascular pressure and α1-adrenoceptor activation activate myocyte PKD2 channels in systemic arteries of different tissues, leading to an inward sodium current (INa), membrane depolarization and vasoconstriction. We also show that PKD2 channels are upregulated during hypertension and that myocyte PKD2 knockout causes vasodilation, attenuates remodeling of the arterial wall and reduces high blood pressure during hypertension. In summary, our study indicates that PKD2 channels in systemic artery myocytes control physiological blood pressure and are upregulated during hypertension, contributing to the blood pressure elevation. Mice with loxP sites flanking exons 11 and 13 (Pkd2fl/fl) of the Pkd2 gene were crossed with tamoxifen-inducible Myh11-cre/ERT2 mice, producing a Pkd2fl/fl:Myh11-cre/ERT2 line. Genotyping was performed using a 3-primer (a, b, c) strategy to identify wild-type (in C57BL/6J), floxed and deleted PKD2 alleles. PCR of genomic DNA from mesenteric and hindlimb arteries of wild-type mice that lack loxP sites produced a 232 bp transcript (Figure 1—figure supplement 1). Tamoxifen-treated Pkd2fl/fl mouse arteries and aorta produced a transcript of 318 bp, which arose from primers a and b (Figure 1—figure supplement 1). PCR amplified a 209 bp transcript in vasculature from tamoxifen-treated Pkd2fl/fl:Myh11-cre/ERT2 mice due to primers a and c, confirming loss of the primer b annealing site. PCR of vasculature in Pkd2fl/fl:Myh11-cre/ERT2 arteries also produced a faint 318 bp band, suggesting that PKD2 is expressed in vascular wall cell types other than myocytes where DNA would not undergo recombination (Figure 1—figure supplement 1). RT-PCR was performed on RNA extracted from arterial myocytes (~500 cells) that had been individually harvested from mesenteric arteries of tamoxifen-treated Pkd2fl/fl and tamoxifen-treated Pkd2fl/fl:Myh11-cre/ERT2 mice. Arterial myocyte cDNA from both genotypes amplified transcripts for both actin and myosin heavy chain 11, a smooth muscle-specific marker (Figure 1A). In contrast, products for PECAM, an endothelial cell marker, and aquaporin 4, an astrocyte marker, were not amplified, suggesting that the isolated mRNA was from pure smooth muscle (Figure 1A). PKD2 primers were designed to anneal to a sequence in exons 9/10 (forward) and 13 (reverse), which span the recombination site (Figure 1A). Transcripts for PKD2 were amplified by cDNA from arterial myocytes of Pkd2fl/fl mice, but not arterial myocytes of Pkd2fl/fl:Myh11-cre/ERT2 mice (Figure 1A). These data indicate that tamoxifen induces PKD2 knockout in arterial myocytes of the Pkd2fl/fl:smCre+ mice (Figure 1A). Activation of Cre recombinase abolishes PKD2 in arterial myocytes of Pkd2fl/fl:myh11cre/ERT2 mice. (A) RT-PCR showing the absence of PKD2 transcript in isolated myocytes from tamoxifen-treated Pkd2fl/fl:myh11-cre/ERT2 mice. (B) Western blots illustrating the effect of tamoxifen-treatment in Pkd2fl/fl and Pkd2fl/fl:myh11-cre/ERT2 mice on PKD2, CaV1.2L (full-length CaV1.2) and CaV1.2S (short CaV1.2) proteins in mesenteric and hindlimb arteries. (C) Mean data for proteins in mesenteric arteries of tamoxifen-treated Pkd2fl/fl:myh11-cre/ERT2 mice when compared to those in tamoxifen-treated Pkd2fl/fl mice. n = 4–7. * indicates p<0.05 versus Pkd2fl/fl. (D) En-face immunofluorescence imaging illustrating that PKD2 protein (red, Alexa Fluor 555) is abolished in myocytes of mesenteric and hindlimb arteries in tamoxifen-treated Pkd2fl/fl:myh11-cre/ERT2 mice (representative of 6 mesenteric and six hindlimb arteries). In contrast, PKD2 protein in endothelial cells is unaltered. Nuclear staining (DAPI) is also shown. Scale bars = 20 µm. (E) Confocal and DIC images illustrating that PKD2 protein (Alexa Fluor 555) is abolished in isolated mesenteric artery myocytes of tamoxifen-treated Pkd2fl/fl:myh11-cre/ERT2 mice (representative data from 5 Pkd2fl/fl and 5 Pkd2fl/fl:myh11-cre/ERT2 mice). Scale bars = 10 µm. Western blotting was performed to quantify proteins in intact arteries of tamoxifen-injected Pkd2fl/fl:Myh11-cre/ERT2 and tamoxifen-injected Pkd2fl/fl mice. In mesenteric and hindlimb arteries of Pkd2fl/fl:Myh11-cre/ERT2 mice, PKD2 protein was ~25.3% and 32.6%, respectively of that in Pkd2fl/fl controls (Figure 1B,C, Figure 1—figure supplement 2A,B). In contrast, TRPC6, TRPM4, and ANO1 channels and PKD1, which can form a complex with PKD2 (Qian et al., 1997; Tsiokas et al., 1997), were similar between genotypes (Figure 1C, Figure 1—figure supplement 2A,B). CaV1.2 protein was similar in mesenteric arteries, but slightly higher (~25.6%) in hindlimb arteries of Pkd2fl/fl:Myh11-cre/ERT2 mice (Figure 1B,C, Figure 1 – figure supplement B). In aorta of Pkd2fl/fl:Myh11-cre/ERT2 mice, PKD2 protein was ~46.8% of that in Pkd2fl/fl, whereas CaV1.2 and PKD1 were similar (Figure 1—figure supplement 2C and D). Piezo1, angiotensin II type one receptors and GPR68 have been proposed to act as vascular mechanosensors (Li et al., 2014; Xu et al., 2018; Schleifenbaum et al., 2014; Blodow et al., 2014). Piezo1, angiotensin II type one receptors and GPR68 proteins were similar in mesenteric and hindlimb arteries of Pkd2fl/fl and Pkd2fl/fl:Myh11-cre/ERT2 mice (Figure 1—figure supplement 3). α-adrenergic receptor subtypes 1A, 1B and 1D were also measured and all were similar in mesenteric and hindlimb arteries of Pkd2fl/fl and Pkd2fl/fl:Myh11-cre/ERT2 mice (Figure 1—figure supplement 3). Immunofluorescence demonstrated that PKD2 protein was present in myocytes of intact arteries and in isolated myocytes of tamoxifen-treated Pkd2fl/fl control mice, but absent in myocytes of tamoxifen-treated Pkd2fl/fl:Myh11-cre/ERT2 mice (Figure 1D,E). In contrast, PKD2 protein was present in endothelial cells of both tamoxifen-treated Pkd2fl/fl and Pkd2fl/fl:Myh11-cre/ERT2 mouse arteries (Figure 1D). These data indicate that PKD2 detected in Western blots of tamoxifen-treated Pkd2fl/fl:Myh11-cre/ERT2 mouse arteries is protein present in cell types other than myocytes that would not be targeted by the smooth muscle-specific Cre. These results indicate that PKD2 is expressed in myocytes of mesenteric and hindlimb arteries and aorta and that tamoxifen treatment of Pkd2fl/fl:Myh11-cre/ERT2 mice selectively abolishes PKD2 expression in myocytes. From this point in the manuscript, tamoxifen-treated Pkd2fl/fl:Myh11-cre/ERT2 mice will be referred to as Pkd2 smKO, with tamoxifen-treated Pkd2fl/fl mice used as controls in all experiments. Telemetry indicated that diastolic and systolic blood pressures were both lower in Pkd2 smKO mice than in Pkd2fl/fl mice (Figure 2A and B). Mean arterial pressure (MAP) was lower in Pkd2 smKO mice during both day and night cycles, was sustained for days and on average was ~ 22.5% lower in Pkd2 smKO mice than in Pkd2fl/fl mice (Figure 2C, Figure 2—figure supplement 1A). Locomotion was similar between genotypes, indicating that the lower blood pressure in Pkd2 smKO mice was not due to inactivity (Figure 2—figure supplement 1B). Echocardiography indicated that cardiac output, fractional shortening, ejection fraction and heart rate were similar in Pkd2 smKO and Pkd2fl/fl mice (Figure 2D). Pkd2 smKO kidney glomeruli and tubules were normal and indistinguishable from those of Pkd2fl/fl mice (Figure 2E). Plasma angiotensin II, aldosterone and ANP and plasma and urine electrolytes were similar in Pkd2 smKO and Pkd2fl/fl mice (Table 1, p>0.05 for all). These results demonstrate that arterial myocyte PKD2 channels control systemic blood pressure and that cardiac function and kidney anatomy and function are similar in Pkd2 smKO and Pkd2fl/fl mice. Pkd2 smKO mice are hypotensive with normal cardiac function and renal histology. (A) Original telemetric blood pressure recordings from Pkd2 smKO and Pkd2fl/fl mice. (B) Mean systolic and diastolic blood pressures in Pkd2fl/fl (n = 11) and Pkd2 smKO (n = 12) mice. * indicates p<0.05 versus Pkd2fl/fl. (C) Mean arterial blood pressures (MAP) in Pkd2fl/fl (n = 11) and Pkd2 smKO (n = 12) mice during day and night (gray) cycles. ZT: Zeitgeber Time. * indicates p<0.05 versus Pkd2fl/fl for all data points. (D) Mean echocardiography data. Cardiac output (CO), fractional shortening (FS), ejection fraction (EF) and heart rate (HR). (Pkd2fl/fl, n = 5; Pkd2 smKO mice, n = 4). (E) Representative images of H and E stained kidney cortex used for histological assessment (n = 3 mice used for for each group). Plasma hormones and plasma and urine electrolytes. Intravascular pressure stimulates vasoconstriction in small, resistance-size arteries. This myogenic response is a major regulator of both regional organ blood flow and systemic blood pressure. To determine whether PKD2 channels contribute to myogenic tone, pressure-induced (20–100 mmHg) vasoconstriction was measured in first-order gastrocnemius arteries. Intravascular pressures greater than 40 mmHg produced increasing levels of constriction in Pkd2fl/fl arteries, reaching ~ 20.9% tone at 100 mmHg (Figure 3A,B). In contrast, pressure-induced vasoconstriction was robustly attenuated in Pkd2 smKO gastrocnemius arteries, which developed only ~ 5.4% tone at 100 mmHg or approximately one quarter of that in Pkd2fl/fl arteries (Figure 3A,B). The passive diameters of Pkd2fl/fl and Pkd2 smKO gastrocnemius arteries were similar (Figure 3—figure supplement 1A). Depolarization (60 mM K+) stimulated slightly larger vasoconstriction in Pkd2 smKO than Pkd2fl/fl gastrocnemius arteries (Figure 3—figure supplement 1B). These data are consistent with the small increase in CaV1.2 protein measured in gastrocnemius arteries of Pkd2 smKO mice and indicate that attenuation of the myogenic response is not due to loss of voltage-dependent Ca2+ channel function and that the reduction in systemic blood pressure may stimulate CaV1.2 expression in hindlimb arteries, but not in mesenteric arteries or aorta (Figure 1C, Figure 1—figure supplement 2B). Pressure-induced vasoconstriction is attenuated in Pkd2 smKO mouse hindlimb arteries. (A) Representative traces illustrating diameter responses to intravascular pressure in gastrocnemius arteries of Pkd2fl/fl and Pkd2 smKO mice. (B) Mean data for myogenic tone in gastrocnemius arteries (Pkd2fl/fl, n = 5; Pkd2 smKO, n = 6). * indicates p<0.05 versus Pkd2fl/fl. (C) Representative traces illustrating hindlimb perfusion pressure in response to increasing flow. (D): Mean data for hindlimb perfusion pressure (Pkd2fl/fl, n = 6; Pkd2 smKO, n = 4). * indicates p<0.05 versus Pkd2fl/fl. Sympathetic control of blood pressure occurs in part due to the activation of α1-adrenergic receptors in arterial myocytes. To investigate the contribution of myocyte PKD2 channels to α1-adrenergic receptor-mediated vasoconstriction, responses to phenylephrine, a selective α1-adrenergic receptor agonist, were measured. Phenylephrine stimulated similar vasoconstrictions in pressurized gastrocnemius arteries of Pkd2fl/fl and Pkd2 smKO mice (Figure 3—figure supplement 1C). To determine whether this similar response to receptor agonists was specific to α1-adrenergic receptors, vasoregulation by angiotensin II was measured. Angiotensin II also stimulated similar vasoconstrictions in Pkd2fl/fl and Pkd2 smKO mouse gastrocnemius arteries (Figure 3—figure supplement 1D). To study vasoregulation in intact skeletal muscle, a perfused hindlimb preparation was used. 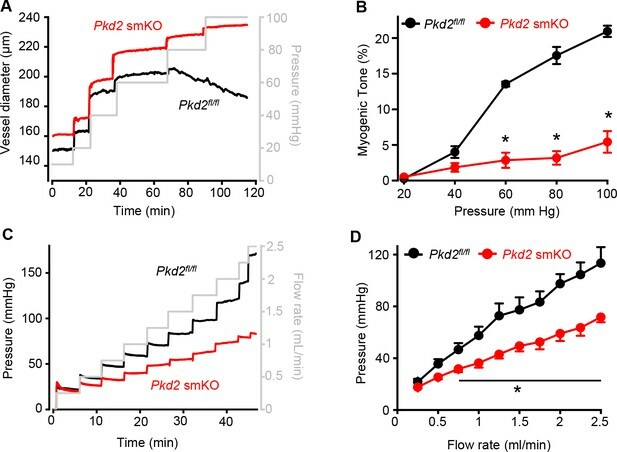 Stepwise increases in intravascular flow produced lower pressures in hindlimbs of Pkd2 smKO mice than in those of Pkd2fl/fl mice (Figure 3C,D). 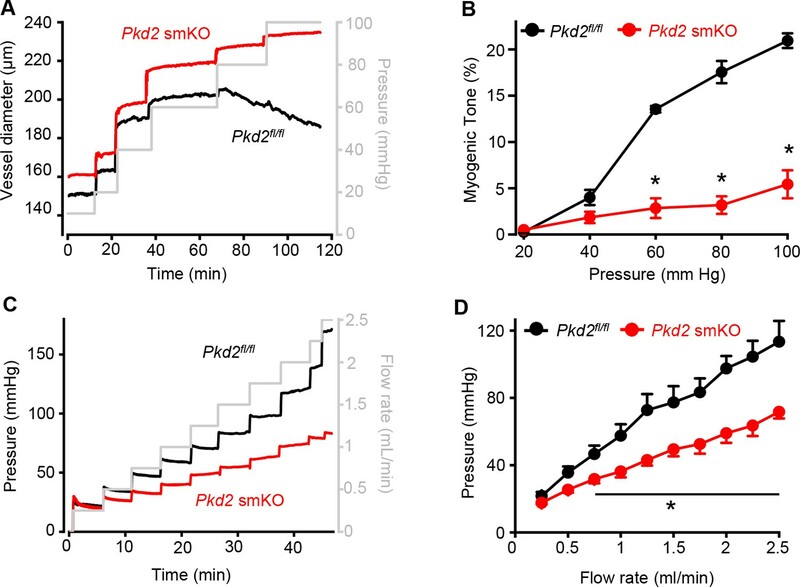 For example, at a flow rate of at 2.5 ml/min the mean pressure in hindlimbs of Pkd2 smKO mice were ~ 63.2% of those in Pkd2fl/fl mice (Figure 3C,D). 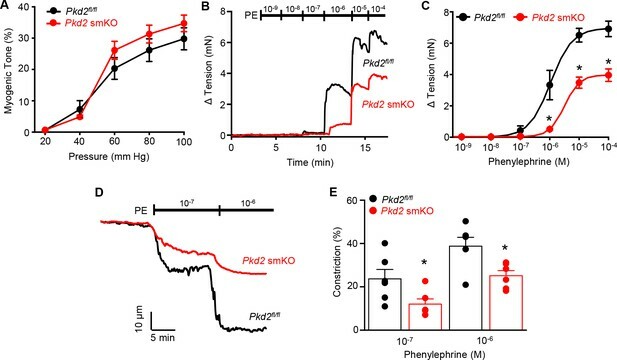 In contrast, at constant flow, phenylephrine similarly increased pressure in hindlimbs of Pkd2 smKO and Pkd2fl/fl mice (Figure 3—figure supplement 1E). These data suggest that arterial myocyte PKD2 channels are essential for pressure-induced vasoconstriction, but not phenylephrine- or angiotensin II-induced vasoconstriction, in hindlimb arteries. To investigate the mechanism(s) by which myocyte PKD2 channels regulate contractility, membrane potential was measured in pressurized hindlimb arteries using glass microelectrodes. At 10 mmHg, the mean membrane potential of Pkd2fl/fl and Pkd2 smKO arteries were similar at ~ −59.6 and −58.5 mV, respectively (Figure 4A,B). Increasing intravascular pressure to 100 mmHg depolarized Pkd2fl/fl arteries by ~ 22.5 mV, but did not alter the membrane potential of arteries from Pkd2 smKO mice (Figure 4A,B). In contrast, phenylephrine depolarized arteries to similar membrane potentials in both genotypes (Figure 4A,B). These data suggest that pressure activates PKD2 channels in myocytes of hindlimb arteries, leading to depolarization and vasoconstriction. PKD2 channels contribute to pressure-induced hindlimb artery depolarization and swelling-activated Na + currents in hindlimb artery myocytes. (A) Representative traces of microelectrode impalements under indicated conditions illustrating that pressure-induced depolarization is attenuated in gastrocnemius arteries of Pkd2 smKO mice. Phenylephrine (PE) = 1 µM. Scale bars: Y = 10 mV, X = 20 s. (B) Mean data for membrane potential recordings in pressurized hindlimb arteries in the absence or presence of PE (Pkd2fl/fl: 10 mmHg, n = 11; 100 mmHg, n = 10; 100 mmHg + PE, n = 13 and Pkd2 smKO: 10 mmHg, n = 11; 100 mmHg, n = 10; 100 mmHg + PE, n = 14). * indicates p<0.05 versus 10 mmHg in Pkd2fl/fl. # indicates p<0.05 versus 100 mmHg in the same genotype. (C) Representative ICats recorded between −100 and +100 mV in isotonic (300 mOsm), hypotonic (250 mOsm) and hypotonic bath solution with Gd3+ (100 µM) in the same Pkd2fl/fl and Pkd2 smKO mouse hindlimb artery myocytes. (D) Representative I-V relationships of Gd+3 -sensitive Icats activated by hypotonic solution in Pkd2fl/fl and Pkd2 smKO hindlimb myocytes. (E) Mean data for Gd3+-sensitive ICats recorded in hypotonic solution in Pkd2fl/fl and Pkd2 smKO myocytes (n = 5 for each). * indicates p<0.05 versus 250 mOsm, # p<0.05 versus Pkd2fl/fl. (F) Representative I-V relationships between −100 and +100 mV in isotonic (300 mOsm), hypotonic (250 mOsm) and hypotonic bath solution with low (40 mM) Na+ in the same Pkd2fl/fl mouse hindlimb artery myocyte. 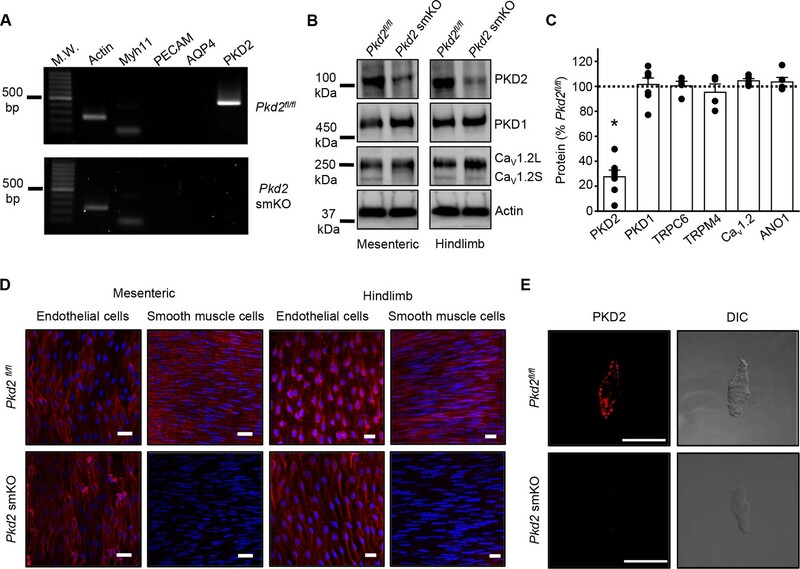 The contribution of PKD2 channels to mechanosensitive currents was investigated in hindlimb artery myocytes. 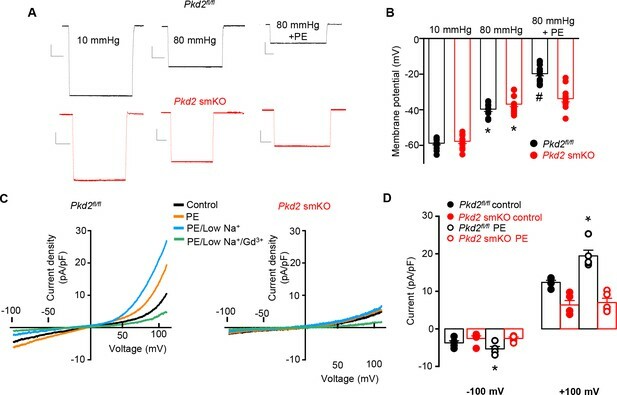 Recent evidence indicates that recombinant PKD2 generates voltage-dependent, outwardly rectifying currents and is primarily a Na+-permeant channel under physiological membrane potentials and ionic gradients (Shen et al., 2016; Gonzalez-Perrett et al., 2002). Whole cell ICat was recorded using the whole-cell patch-clamp configuration with symmetrical Na+ solutions. In Pkd2fl/fl myocytes, reducing bath solution osmolarity from 300 to 250 mOsm caused cell swelling and activated an outwardly rectifying ICat that increased 2.3 ± 0.3 and 3.0 ± 0.7 fold at −100 and + 100 mV, respectively (p<0.05, n = 5, Figure 4C). Swelling-activated ICat was inhibited by Gd3+, a non-selective cation channel blocker (Figure 4C,D,E). The mean reversal potential for ICat was similar in isotonic (−0.2 ± 1.3 mV) and hypotonic solutions (0.1 ± 3.8 mV; p>0.05), suggesting that swelling activated a INa. To test this conclusion experimentally, Na+ substitution experiments were performed. In a hypotonic bath solution, a reduction in bath [Na+] from 115 to 40 mM shifted the Erev to −14.6 ± 0.5 mV in Pkd2fl/fl myocytes (n = 5, p<0.05 versus Erev in 250 mOsm) (Figure 4F). When adjusted for the liquid junction potential caused by the solution change (+6.9 mV), the corrected Erev is −21.5 ± 0.5 mV, which is similar to the calculated ENa (−24.2 mV). Reducing bath Na+ also decreased inward current and increased outward current. In contrast, swelling did not activate a ICat (p<0.05, n = 5), nor did Gd3+ alter ICat when applied in hypotonic bath solution, in hindlimb artery myocytes of Pkd2 smKO mice (Figure 4C,D,E). In further contrast to the differential effects of cell swelling, phenylephrine activated similar amplitude ICats in hindlimb artery myocytes of Pkd2fl/fl and Pkd2 smKO mice (Figure 4—figure supplement 1). These data indicate that cell swelling activates PKD2 channels, leading to a Na+ current in hindlimb artery myocytes, whereas phenylephrine does not activate PKD2 channels in this cell type. Mesenteric arteries were studied to determine whether myocyte PKD2 channels control contractility in another arterial bed that is a major regulator of systemic blood pressure. In contrast to the robust attenuation of myogenic vasoconstriction in gastrocnemius arteries of Pkd2 smKO mice, pressure- and depolarization-induced vasoconstriction was similar in mesenteric arteries of Pkd2 smKO and Pkd2fl/fl mice (Figure 5A, Figure 5—figure supplement 1B). Myogenic tone was similar regardless of whether third, fourth, or fifth-order Pkd2 smKO and Pkd2fl/fl mouse mesenteric arteries were studied (Figure 5—figure supplement 1A). Passive diameter of mesenteric arteries was not altered by myocyte PKD2 knockout (Figure 3—figure supplement 1A). The differential contribution of myocyte PKD2 channels to pressure-induced vasoconstriction in gastrocnemius and mesenteric arteries was not due to size, as passive diameters of first-order gastrocnemius and third-order mesenteric arteries were similar (Figure 3—figure supplement 1A). Pressure-induced vasoconstriction is unaltered, whereas phenylephrine-induced vasoconstriction is attenuated, in mesenteric arteries of Pkd2 smKO mice. (A) Mean vasoconstriction over a range of pressures in resistance-size mesenteric arteries from Pkd2fl/fl (n = 7) and Pkd2 smKO (n = 9) mice. (B) Original recordings of concentration-dependent, phenylephrine (PE)-induced contraction in mesenteric artery rings. (C) Mean PE-induced contraction (Pkd2fl/fl, n = 5; Pkd2 smKO, n = 6; *p<0.05 versus Pkd2fl/fl). (D) Representative phenylephrine-induced vasoconstriction in pressurized (80 mmHg) fifth-order mesenteric arteries. (E) Mean PE-induced vasoconstriction in pressurized (80 mmHg) fourth-and fifth-order mesenteric arteries (Pkd2fl/fl, n = 6; Pkd2 smKO, n = 6; *p<0.05 versus Pkd2fl/fl at the same PE concentration). The splanchnic circulation receives considerable sympathetic innervation. To investigate the contribution of myocyte PKD2 channels to α1-adrenoceptor-mediated responses, phenylephrine-induced vasoconstriction was measured. Phenylephrine-induced isometric contractions in mesenteric artery (first- and second-order) rings of Pkd2 smKO mice were smaller than those in Pkd2fl/fl controls (Figure 5B,C). For instance, with 1 µM phenylephrine, contractions in Pkd2 smKO arteries were ~ 15.3% of those in Pkd2fl/fl arteries, with maximal phenylephrine-induced contraction ~ 57.3% of that in Pkd2fl/fl arteries (Figure 5B,C). The mean concentration of phenylephrine-induced half-maximal contraction (EC50, µM) was slightly higher in Pkd2 smKO (2.4 ± 0.2) than Pkd2fl/fl (1.1 ± 0.3) arteries (p<0.05, Figure 5B,C). In pressurized (80 mmHg) mesenteric (fourth- and fifth-order) arteries of Pkd2 smKO mice, phenylephrine-induced vasoconstrictions were between ~ 50.9% and 64.8% of those in Pkd2fl/fl controls (Figure 5D,E). Similar results were obtained with endothelium-denuded mesenteric arteries, indicating that attenuated vasoconstriction to phenylephrine was due to loss of PKD2 in myocytes (Figure 5—figure supplement 1C and D). In contrast to attenuated phenylephrine-mediated vasoconstriction, angiotensin II-induced constriction was not different between Pkd2fl/fl and Pkd2 smKO mesenteric arteries (Figure 5—figure supplement 1E). These data indicate that arterial myocyte PKD2 channels are activated by distinct vasoconstrictor stimuli in arteries of different tissues, contributing to α1-adrenoceptor-mediated vasoconstriction in mesenteric arteries and essential for the myogenic response in hindlimb arteries. At an intravascular pressure of 10 mmHg, the membrane potential of Pkd2fl/fl and Pkd2 smKO mesenteric arteries was similar (Figure 6A,B). An increase in pressure to 80 mmHg stimulated a similar depolarization in mesenteric arteries of Pkd2fl/fl and Pkd2 smKO mice, to ~39.7 and 36.7 mV, respectively (Figure 6A,B). Phenylephrine application further depolarized Pkd2fl/fl mesenteric arteries by ~19.9 mV, but did not change the membrane potential of Pkd2 smKO arteries (Figure 6A,B). PKD2 channels contribute to phenylephrine-induced mesenteric artery depolarization and INa in mesenteric artery myocytes. (A) Representative traces of microelectrode impalements illustrating that phenylephrine (PE, 1 µM)-induced depolarization is attenuated in mesenteric arteries of Pkd2 smKO mice. Scale bars: Y = 10 mV, X = 20 s. (B) Mean membrane potential recordings in pressurized (10 and 80 mmHg) mesenteric arteries and in PE at 80 mmHg (Pkd2fl/fl: 10 mmHg, n = 13; 80 mmHg, n = 9; 80 mmHg + PE, n = 15. Pkd2 smKO: 10 mmHg, n = 11; 80 mmHg, n = 12; 80 mmHg + PE, n = 12). *p<0.05 versus 10 mmHg in the same genotype. # p<0.05 versus 80 mmHg in the same genotype. (C) Original current recordings obtained between −100 and +100 mV in the same Pkd2fl/fl and Pkd2 smKO myocytes in control, PE (10 μM), low Na+ (40 mM)+PE and low Na+ (40 mM)+PE + Gd3+ (100 µM). (D) Mean paired data (Pkd2fl/fl, n = 5; Pkd2 smKO, n = 5; *p<0.05 versus control in the same genotype). To examine phenylephrine-regulation of ICat in isolated mesenteric artery myocytes, the whole-cell patch-clamp configuration was used with symmetrical 140 mM NaCl. In Pkd2fl/fl cells, phenylephrine activated outwardly rectifying ICat, increasing density ~ 1.43 and 1.57-fold at −100 mV and + 100 mV, respectively (Figure 6C,D). In the presence of phenylephrine, a reduction in bath [Na]o from 140 to 40 mM shifted the Erev from 0.5 ± 0.5 to −23.2 ± 1.6 mV in Pkd2fl/fl myocytes (n = 5, p<0.05 versus PE/low Na+). When corrected for the liquid junction potential (+5.6 mV) caused by the change in bath [Na]o, this Erev is −28.8 ± 1.6 mV, which is similar to calculated ENa (−32.8 mV) under these conditions. Reducing bath Na+ also reduced inward current and increased outward current. The subsequent addition of Gd3+ reduced current density to ~ 44.9% and 20.7% of that in phenylephrine/40 mM Na+at −100 and + 100 mV, respectively (n = 5, p<0.05, Figure 6C). In contrast to effects in Pkd2fl/fl myocytes, phenylephrine did not alter ICat in Pkd2 smKO myocytes (Figure 6C,D). In further contrast to the differential effects of phenylephrine, swelling activated similar amplitude ICat in mesenteric artery myocytes of Pkd2fl/fl and Pkd2 smKO mice (Figure 6—figure supplement 1). These data indicate that phenylephrine activates PKD2 channels, leading to a INa in mesenteric artery myocytes, whereas cell swelling does not activate PKD2 channels in mesenteric artery myocytes. We tested the hypothesis that arterial myocyte PKD2 channels are associated with the increase in blood pressure during hypertension. Angiotensin II-infusion is a well-established method to produce a stable elevation in mean arterial pressure. Blood pressure was measured following implantation of subcutaneous osmotic minipumps that infused angiotensin II or saline in Pkd2 smKO and Pkd2fl/fl mice. Angiotensin II steadily increased MAP to a plateau of ~155.6 mmHg in Pkd2fl/fl mice and to ~ 134.6 mmHg in Pkd2 smKO mice (Figure 7A). The angiotensin II-induced increase in MAP (ΔMAP) was ~ 25.6% smaller in Pkd2 smKO than Pkd2fl/fl mice (Figure 7A). Saline infusion did not alter blood pressure in either Pkd2 smKO or Pkd2fl/fl mice. These data indicate that myocyte PKD2 channel knockout reduces both the absolute systemic blood pressure and the increase in blood pressure during hypertension. Angiotensin II-induced hypertension is attenuated in Pkd2 smKO mice. (A) Telemetric blood pressure time course showing the development of angiotensin II-induced hypertension in Pkd2fl/fl (n = 6) and Pkd2 smKO mice (n = 9). Osmotic minipumps containing either saline or angiotensin II were implanted one day prior to day 0. * indicates p<0.05 versus Pkd2fl/fl in the same condition. (B) Western blots illustrating total PKD2 protein in mesenteric and hindlimb arteries of saline-and angiotensin II-treated control mice. (C) Mean total PKD2 protein in mesenteric and hindlimb arteries of angiotensin II-treated mice compared to saline control (n = 8 for each group). * indicates p<0.05 versus saline in the same arterial preparation. (D) Western blots showing surface and intracellular PKD2 protein in arteries of saline-and angiotensin II-treated mice. (E) Mean surface PKD2 protein in mesenteric and hindlimb arteries of angiotensin II-treated mice compared to saline control (n = 8 for each group). * indicates p<0.05 versus saline in the same arterial preparation. (F) Mean data illustrating the percentage of total PKD2 located at the surface in mesenteric and hindlimb arteries of saline-and angiotensin II-treated mice (n = 4 for each group). To investigate mechanisms by which arterial myocyte PKD2 channels may be associated with an increase in blood pressure during hypertension, total and surface proteins were measured in arteries. PKD2 total protein in mesenteric and hindlimb arteries of angiotensin II-induced hypertensive mice were ~ 149.2% and 143.4%, respectively, of those in normotensive mice (Figure 7B,C). Arterial biotinylation revealed that surface PKD2 protein in mesenteric and hindlimb arteries of hypertensive mice were also ~ 150.3% and 145.9% of those in controls (Figure 7D,E). In contrast, cellular distribution of PKD2 was similar in mesenteric and hindlimb arteries of normotensive and hypertensive mice, with ~ 85% of protein located in the plasma membrane (Figure 7F). These data indicate that during hypertension, an increase in total PKD2 protein leads to an increase in the abundance of surface PKD2 channels. To test the hypothesis that the reduction in systemic blood pressure in Pkd2 smKO mice during hypertension was due to vasodilation, the contractility of pressurized (80 mmHg) mesenteric arteries was measured using myography. Phenylephrine-induced vasoconstrictions in angiotensin II-treated Pkd2 smKO mouse arteries were between ~67.6% and 71.1% of those in Pkd2fl/fl arteries (Figure 8A). In contrast, myogenic tone was similar in arteries of angiotensin II-treated Pkd2 smKO and Pkd2fl/fl mice (Figure 8B). These results indicate that knockout of arterial myocyte PKD2 channels attenuates phenylephrine-induced vasoconstriction during hypertension. These data also suggest that hypertension does not promote the emergence of a mechanism by which PKD2 channels contribute to the myogenic response in mesenteric arteries. Arterial myocyte PKD2 knockout attenuates vasoconstriction and arterial wall remodeling during hypertension. (A) Mean phenylephrine-induced vasoconstriction in pressurized (80 mmHg) mesenteric arteries from angiotensin II-treated mice (Pkd2fl/fl, n = 7–8; Pkd2 smKO, n = 8). Hypertension is associated with inward remodeling of vasculature (Schiffrin, 2012). To investigate the involvement of myocyte PKD2 channels in pathological remodeling, arterial sections from angiotensin II-treated Pkd2 smKO and Pkd2fl/fl mice were imaged and analyzed. In saline-treated Pkd2 smKO and Pkd2fl/fl mice, the wall-to-lumen ratio of mesenteric arteries was similar (Figure 8C,D). Angiotensin II infusion increased the artery wall-to-lumen ratio ~2.9 fold in Pkd2fl/fl mice, but only 1.3-fold in Pkd2 smKO mice, or ~89.6% less (Figure 8C,D). These data suggest that PKD2 knockout in myocytes attenuates arterial remodeling during hypertension. Previous studies performed in vitro have suggested that arterial myocytes express several different TRP channels, but in vivo physiological functions of these proteins are unclear. Here, we generated an inducible, smooth muscle-specific knockout of a TRP channel, PKD2, to investigate blood pressure regulation by this protein. We show that tamoxifen-induced, smooth muscle-specific PKD2 knockout dilates resistance-size systemic arteries and reduces blood pressure. Data indicate that heterogeneous vasoconstrictor stimuli activate PKD2 channels in arterial myocytes of different tissues. PKD2 channel activation leads to a INa in myocytes, which induces membrane depolarization and vasoconstriction. Furthermore, we show that hypertension is associated with an increase in plasma membrane-resident PKD2 channels. PKD2 channel knockout in myocytes of hypertensive mice caused vasodilation, prevented arterial remodeling and lowered systemic blood pressure. In summary, using an inducible, conditional knockout model we show that arterial myocyte PKD2 channels increase physiological systemic blood pressure. We also show that arterial myocyte PKD2 channels are upregulated during hypertension and genetic knockout reduces high blood pressure. The regulation of blood pressure by arterial myocyte TRP proteins and involvement in hypertension are poorly understood (Earley and Brayden, 2015). This lack of knowledge is due to several primary factors. First, it is unclear which TRP channel family members are expressed and functional in myocytes of resistance-size systemic arteries that control blood pressure. The identification of a TRP channel in blood vessels that do not regulate systemic blood pressure, such as aorta and cerebral arteries, does not necessarily indicate that the same protein is present in arteries that do control blood pressure (Earley and Brayden, 2015). Second, TRP channel expression has often been reported in myocytes that had undergone cell culture or in whole vasculature that contains many different cell types. These studies create uncertainty as to which TRP proteins are present specifically in contractile myocytes of resistance-size systemic arteries (Earley and Brayden, 2015). Third, the lack of specific modulators of individual TRP channel subfamily members has significantly hampered studies aimed at identifying in vitro and in vivo functions of these proteins. Fourth, TRP channels are expressed in many different cell types other than arterial myocytes. Blood pressure measurements in global, non-inducible TRP knockout mice generated contrasting results to those anticipated. Myocyte TRPM4 channel activation leads to vasoconstriction in isolated cerebral arteries, but global, constitutive knockout of TRPM4 elevated blood pressure in mice (Mathar et al., 2010; Earley et al., 2004). Arterial myocyte TRPC6 channel activation contributes to myogenic tone in cerebral arteries, but global, constitutive TRPC6 knockout caused vasoconstriction and elevated blood pressure in mice (Dietrich et al., 2005). TRPV4 channel activation in arterial myocytes leads to vasodilation in isolated vessels, but blood pressure in TRPV4-/- mice was the same or lower than controls (Nishijima et al., 2014; Earley et al., 2009). Alternative approaches, such as the inducible, cell-specific knockout model developed here, are valuable to advance knowledge of blood pressure regulation by arterial myocyte TRP channels. Previous studies performed in vitro that investigated vasoregulation by PKD2 channels produced a variety of different findings. RNAi-mediated knockdown of PKD2 inhibited swelling-activated non-selective cation currents (ICat) in rat cerebral artery myocytes and reduced myogenic tone in pressurized cerebral arteries (Narayanan et al., 2013). In contrast, PKD2 siRNA did not alter myogenic tone in mesenteric arteries of wild-type mice, but increased both stretch-activated cation currents and myogenic vasoconstriction in arteries of constitutive, myocyte PKD1 knockout mice (Sharif-Naeini et al., 2009). From these results, the authors suggested that myocyte PKD2 channels inhibit mesenteric vasoconstriction (Sharif-Naeini et al., 2009). Global knockout of PKD2 is embryonic-lethal in mice due to cardiovascular and renal defects, prohibiting study of the loss of protein in all tissues on vascular function (Wu et al., 2000; Boulter et al., 2001). In global PKD2+/- mice, an increase in actin and myosin expression lead to larger phenylephrine-induced contraction in aorta and mesenteric arteries (Qian et al., 2007; Du et al., 2010). Here, using an inducible cell-specific knockout model, we show that swelling, a mechanical stimulus, activates PKD2 currents in myocytes of skeletal muscle arteries, whereas phenylephrine activates PKD2 currents in myocytes of mesenteric arteries. Regardless of the stimulus involved, PKD2 activation leads to a Na+ current, membrane depolarization and vasoconstriction in both artery types. PKD2 appears to be the second TRP protein to have been described in in arterial myocytes of skeletal muscle arteries, TRPV1 being the other (Kark et al., 2008). Few studies have measured plasma membrane currents through either recombinant PKD2 channels or PKD2 channels expressed in native cell types. PKD2 channels have been observed at the cell surface, with evidence suggesting that PKD1 is required for PKD2 translocation, although the ability of PKD1 to perform this function has been questioned (Shen et al., 2016; Hanaoka et al., 2000). Here, using arterial biotinylation we show that ~85% of PKD2 protein is located in the plasma membrane in both mesenteric and hindlimb arteries, consistent with our previous data in cerebral arteries (Narayanan et al., 2013). PKD2 ion permeability has also been a matter of debate. Recombinant PKD2 was initially shown to both conduct Ca2+ and to be inhibited by Ca2+ (Hanaoka et al., 2000; Cai et al., 2004). To increase surface-trafficking of recombinant PKD2, a recent study generated a chimera by replacing the pore of PKD2-L1, a related channel that readily traffics to the plasma membrane, with the PKD2 channel pore (Shen et al., 2016). This channel, which contained the PKD2 channel filter, generated outwardly-rectifying whole cell currents and was more selective for Na+ and K+ than Ca2+, with Ca2+ only able to permeate in an inward direction (Shen et al., 2016). We also show that PKD2 channels in hindlimb and mesenteric artery myocytes are outwardly rectifying and permeant to Na+. At physiological arterial potentials of ~−60 to −40 mV, PKD2 channel opening would produce an inward Na+ current, leading to myocyte membrane depolarization and voltage-dependent Ca2+ (CaV1.2) channel activation (Jaggar et al., 2000). The ensuing increase in intracellular Ca2+ concentration would stimulate vasoconstriction and an elevation in blood pressure, as observed here. PKD2 channel knockout abolishes the stimulus-induced inward Na+ current, attenuating depolarization and vasoconstriction. The splanchnic and skeletal muscle circulations account for up to 35 and 80 (during physical exertion) % of cardiac output, respectively. Changes in arterial contractility within these organs leads to significant modification of total peripheral resistance and systemic blood pressure. We demonstrate that myocyte PKD2 channels regulate contractility in both of these physiologically important circulations. Our data also show that distinct mechanical and chemical stimuli activate PKD2 channels in these arteries to produce vasoconstriction. Intravasulcar pressure stimulates vasoconstriction in resistance-size arteries from a wide variety of tissues. Mice lacking α1-adrenergic receptors are hypotensive and have reduced vasoconstrictor responses to phenylephrine in mesenteric arteries, highlighting the relevance of this pathway to blood pressure regulation (Tanoue et al., 2002). α1-adrenergic receptor activation is reported to stimulate vasoconstriction through the release of intracellular Ca2+ stores and the activation of voltage-dependent Ca2+ channels and non-selective cation channels (Utz et al., 1999; Inoue and Kuriyama, 1993; Eckert et al., 2000). We show that intravascular pressure stimulates PKD2 channels in myocytes of hindlimb arteries, whereas phenylephrine activates PKD2 channels in mesenteric artery myocytes. Stimulus-induced PKD2 channel activation in these arteries leads to vasoconstriction. Surprisingly, we found that myocyte PKD2 channels do not contribute to the myogenic response in mesenteric arteries or to phenylephrine-induced vasoconstriction in hindlimb arteries. Angiotensin II-induced vasoconstriction did not require myocyte PKD2 channels in either hindlimb or mesenteric arteries. These data indicate that stimuli which activate myocyte PKD2 channels are vascular bed-specific, strengthening the concept that the regulation and function of a protein is not homogeneous in the circulation and findings in myocytes of one arterial bed should not simply be translated to other vasculature. Arteries of diverse organs are exposed to unique environments, including the range of intravascular pressures and the types and concentrations of vasoconstrictor and vasodilator stimuli that regulate contractility. Thus, it would be surprising if the molecular components of intracellular signaling pathways were identical in arterial myocytes of different organs. It was outside of the central aim of this study and beyond scope to determine the differential mechanisms by which pressure and adrenergic receptors activate PKD2 channels in arteries of different organs. Several possibilities exist. Pressure-induced vasoconstriction was described over 100 years ago and yet the mechanosensor, intracellular signal transduction pathways and the ion channels that produce this physiological response are still unresolved (Bayliss, 1902). Candidates for the pressure mechanosensor include, one or more proteins that have been proposed in smooth muscle or non-smooth muscle cell types, proteins that have not yet been discovered, elements of the cytoskeleton, or ion channels that act alone, in series or in parallel with other proteins and may be homomultimeric or heteromultimeric proteins. 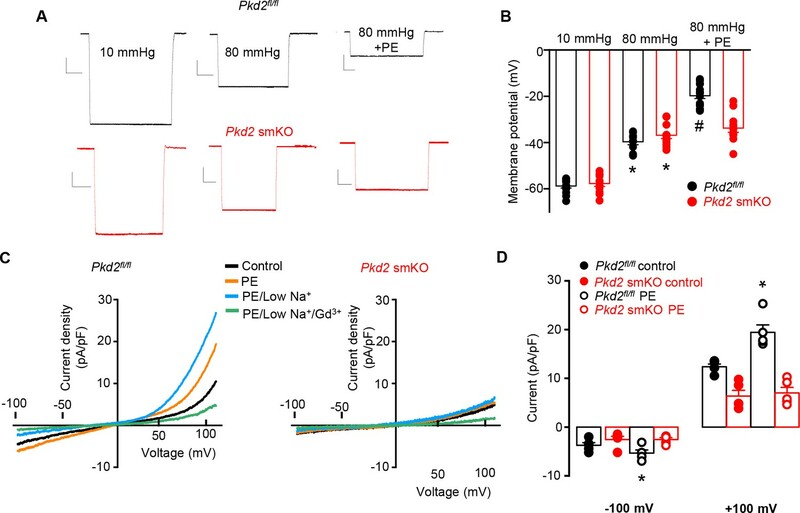 Piezo1, angiotensin II type one receptors and GPR68 have been proposed to act as vascular mechanosensors (Li et al., 2014; Xu et al., 2018; Schleifenbaum et al., 2014; Blodow et al., 2014). Importantly, we show here that there is not a singular, homogeneous mechanism that mediates the myogenic response in all artery types, adding additional complexity to this question. It is possible that intravascular pressure mechanosensors are different in hindlimb and mesenteric artery myocytes. If this is the case, the mechanosensor protein(s) present in hindlimb artery myocytes activates PKD2 channels, whereas the mechanosensor(s) in mesenteric artery myocytes does not stimulate PKD2 and vice versa. The intracellular signaling pathways by which pressure and α1-adrenergic receptors activate PKD2 channels may also not be the same or may couple differently in myocytes of each artery type. Intracellular pathways that transduce the pressure signal to activate ion channels are not resolved, although Gq11-coupled phospholipase C (PLC) activation is one candidate (Kauffenstein et al., 2012). α1-adrenergic receptors also activate Gq/11. Thus, if pressure and α1-adrenergic receptors both stimulate Gq11, local or global proximity signaling to PKD2 channels may underlie differential signaling in each artery type. When considering the molecular identity of the channels that are involved, PKD2 can form both homotetramers and heteromultimers with other channels, including TRPC1 and TRPV4 (Hanaoka et al., 2000; Köttgen et al., 2008; Zhang et al., 2009; Bai et al., 2008; González-Perrett et al., 2001). Whether PKD2 forms homomers or heteromers with other TRP channels in arterial myocytes is unclear, but differential PKD2 channel tetramerization may also underlie the distinct activation of these proteins by pressure and α1-adrenergic receptors in hindlimb and mesenteric arteries. Other channels, including TRPC6, TRPM4 and ANO1 contribute to the myogenic tone in cerebral arteries, but their relationship to PKD2-mediated responses in mesenteric and hindlimb arteries is unclear (Welsh et al., 2002; Earley et al., 2004; Bulley et al., 2012). Conceivably, other ion channels may signal in series to PKD2, with the proteins involved and the sequence of events differing in mesenteric and hindlimb artery myocytes. Given the large number of unresolved signaling elements and the possible permutations that would require study, it was beyond scope to determine the differential mechanisms by which pressure and adrenergic receptors activate PKD2 channels in arteries of different organs. Future studies should investigate these possibilities. Having established that myocyte PKD2 channels regulate arterial contractility and systemic blood pressure, we investigated whether hypertension is associated with an alteration in PKD2 expression, surface protein and function. Total and surface PKD2 protein were both higher in mesenteric and hindlimb arteries of hypertensive mice than in normotensive controls, indicating upregulation. PKD2 protein was primarily located in the plasma membrane in arteries of normotensive and hypertensive mice demonstrating that the distribution of channels was unchanged. These data indicate that hypertension is associated with an increase in the amount of PKD2 protein, which traffics to the plasma membrane, thereby increasing surface channel number. Myocyte-specific PKD2 knockout reduced both phenylephrine-induced vasoconstriction and systemic blood pressure and prevented an increase in wall-to-lumen thickness in hypertensive mice. The angiotensin II-induced elevation in blood pressure was smaller in Pkd2 smKO mice than in Pkd2fl/fl controls, supporting the concept that a higher abundance of surface PKD channels in arterial myocytes was associated with vasoconstriction. Our data demonstrate that myocyte PKD2 channels are upregulated during hypertension and that PKD2 targeting reduces vasoconstriction, blood pressure and arterial remodeling during hypertension, eliciting multi-modal benefits. When considering our findings, a discussion of human diseases that are known to be associated with PKD2 is warranted. Autosomal Dominant Polycystic Kidney Disease (ADPKD) is the most prevalent monogenic human disease worldwide, affecting 1 in 1000 people. ADPKD occurs due to mutations in either PKD1 or PKD2 proteins (Torres et al., 2007). Currently, more than 275 human variants in PKD2 have been identified (Autosomal Dominant Polycystic Kidney Disease Mutation Database, Mayo Clinic; http://pkdb.pkdcure.org). ADPKD is characterized by the appearance of renal cysts, although a significant proportion of patients with apparently normal renal function develop hypertension prior to the development of cysts (Torres et al., 2007; Valero et al., 1999; Martinez-Vea et al., 2004). Here, we show that myocyte PKD2 knockout reduced systemic blood pressure, which is in apparent contrast to the blood pressure increase observed in ADPKD patients. There are several explanations for these differential findings. First, the effects of complete PKD2 abrogation, such as in the knockout studied here, and that of a PKD2 mutation found in an ADPKD patient, on arterial myocyte function may differ. Second, a global PKD2 mutation in an ADPKD patient will alter the function of all cell types in which PKD2 is expressed. Such widespread changes in the physiology of many different cell types could alter arterial myocyte contractility and blood pressure through a variety of mechanisms, leading to net vasoconstriction even if myocyte PKD2 function is also compromised. Third, in ADPKD patients PKD2 mutation is constitutive, whereas here we studied the effects of PKD2 knockout over a three week period in fully developed adult mice. A constitutive PKD2 mutation may modify vascular development and may have chronic effects on myocyte signaling that would not occur in our study. Fourth, the loss of PKD2 function in arterial myocytes of ADPKD patients may attenuate the blood pressure elevation that occurs due to the loss of PKD2 function in other cell types. Future studies should be designed to investigate the effects of PKD2 mutations that occur in ADPKD patients on vascular myocyte function and systemic blood pressure. Our demonstration that myocyte PKD2 channels regulate blood pressure is a step forward to better understanding the significance of this myocyte ion channel in cardiovascular physiology and disease. In summary, we show that arterial myocyte PKD2 channels are activated by distinct stimuli in arteries of different tissues, increase systemic blood pressure, are upregulated during hypertension and genetic knockout in vivo leads to vasodilation and a reduction in both physiological and high blood pressure. (M. musculus) Myh11-cre/ERT2 Jackson Laboratories. All procedures were approved by the Animal Care and Use Committee of the University of Tennessee. Pkd2fl/fl mice with loxP sites flanking exons 11–13 of the Pkd2 gene were obtained from the John Hopkins PKD Core. Pkd2fl/fl mice were crossed with tamoxifen-inducible smooth muscle-specific Cre mice (Myh11-cre/ERT2, Jackson Labs, ref. (Zhang et al., 2009)) to produce Pkd2fl/fl:Myh11-cre/ERT2 mice. Male Pkd2fl/fl:Myh11-cre/ERT2 or Pkd2fl/fl mice (6–10 weeks of age) were injected with tamoxifen (1 mg/ml, i.p.) once per day for 5 days and studied no earlier than 17 days after the last injection. C57BL/6J mice (12 weeks old) were purchased from Jackson Laboratories. Angiotensin II (1.5 ng/g/min) and saline (0.9 NaCl) were infused in mice using subcutaneous osmotic minipumps (Alzet). Mice were euthanized with isofluorane (1.5%) followed by decapitation. First- to fifth-order mesenteric and hindlimb (saphenous, popilital and gastrocnemius) arteries were removed and placed into ice-cold physiological saline solution (PSS) that contained (in mM): 112 NaCl, 6 KCl, 24 NaHCO3, 1.8 CaCl2, 1.2 MgSO4, 1.2 KH2PO4 and 10 glucose, gassed with 21% O2, 5% CO2 and 74% N2 to pH 7.4. Arteries were cleaned of adventitial tissue and myocytes dissociated in isolation solution containing (in mM): 55 NaCl, 80 sodium glutamate, 5.6 KCl, 2 MgCl2, 10 HEPES and 10 glucose (pH 7.4, NaOH) using enzymes, as previously described (Qian et al., 1997). Genomic DNA was isolated from mesenteric and hindlimb arteries using a Purelink Genomic DNA kit (ThermoFisher Scientific). Reaction conditions used are outlined in the Baltimore PKD core center genotyping protocol (http://baltimorepkdcenter.org/mouse/PCR%20Protocol%20for%20Genotyping%20PKD2KO%20and%20PKD2%5Eneo.pdf). Genotyping was performed using a 3-primer strategy, with primers a (5’-CCTTTCCTCTGGTTCTGGGGAG), b (5’-GTTGATGCTTAGCAGATGATGGC) and c (5’-CTGACAGGCACCTACAGAACAGTG) used to identify floxed and deleted alleles. Fresh, dissociated mesenteric artery myocytes were manually collected using an enlarged patch pipette under a microscope. Total RNA was extracted from ~ 500 myocytes using the Absolutely RNA Nanoprep kit (Agilent Technologies, Santa Clara, CA, USA). First-strand cDNA was synthesized from 1 to 5 ng RNA using SuperScript IV (Invitrogen, Life Technologies). PCR was performed on first-strand cDNA using the following conditions: an initial denaturation at 94°C for 2 min, followed by 40 cycles of denaturation at 94°C for 30 s, annealing at 56°C for 30 s, and extension at 72°C for 1 min. PCR products were separated on 2% agarose–TEA gels. Primers were used to amplify transcripts of PKD2, aquaporin 4, myosin heavy chain 11, platelet-endothelial cell adhesion molecule 1 (PECAM-1) and actin (Supplementary file 1). The PKD2 forward primer spanned the junction of exons 9 and 10 and the reverse primer annealed to exon 13. Proteins were separated on 7.5% SDS-polyacrylamide gels and blotted onto PVDF membranes. Membranes were blocked with 5% milk and incubated with the following primary antibodies: CaV1.2 (Neuromab), PKD1 and PKD2 (Santa Cruz, sc-100415), ANO1, TRPC6 and TRPM4 (Abcam) and actin (MilliporeSigma) overnight at 4°C. Membranes were washed and incubated with horseradish peroxidase-conjugated secondary antibodies at room temperature. Protein bands were imaged using an Amersham Imager 600 gel imaging system (GE Healthcare) and quantified using ImageJ software. Arteries were cut longitudinally and fixed with 4% paraformaldehyde in PBS for 1 hr. Following a wash in PBS, arteries were permeabilized with 0.2% Triton X-100, blocked with 5% goat serum and incubated overnight with PKD2 primary antibody (Rabbit mAB 3374 CT-14/4: Baltimore PKD Center) at 4°C. Arteries were then incubated with Alexa Fluor 555 rabbit anti-mouse secondary antibody (1:400; Molecular Probes) and 4’,6-diamidino-2-phenylindole, dihydrochloride (DAPI) (1:1000; Thermo Scientific) for 1 hr at room temperature. Segments were washed with PBS, oriented on slides with the endothelial layer downwards and mounted in 80% glycerol solution. DAPI and Alexa 555 were excited at 350 nm and 555 nm with emission collected at ≤437 nm and ≥555 nm, respectively. Myocytes were plated onto poly-L-lysine-coated coverslips, fixed with 3.7% paraformaldehyde in PBS and permeabilized with 0.1% Triton X-100. After blocking with 5% BSA, cells were incubated with mouse monoclonal anti-PKD2 antibody (Santa Cruz) overnight at 4°C. Slides were then washed and incubated with Alexa Fluor 555 rabbit anti-mouse secondary antibody (Molecular Probes). Secondary antibodies were washed and coverslips mounted onto slides. Images were acquired using a Zeiss 710 (Carl Zeiss) laser-scanning confocal microscope and 40x and 63x oil immersion objectives. Kidney sections were stained with H and E and examined by Probetex, Inc (San Antonio, Texas). Briefly, tubules, glomeruli and vasculature were examined for frequency or homogeneity of pathologic abnormalities. These included characteristics of hypercellularity, hypocellularity, necrosis, apoptosis, matrix accumulation, inflammation, fibrosis and protein droplets. The size and thickness of the cortex, medulla, papilla, glomeruli, tubules and vasculature were also examined. Radiotelemetric transmitters (PA-C10, Data Sciences International) were implanted subcutaneously into anesthetized mice, with the sensing electrode placed in the aorta via the left carotid artery. Seven days later blood pressures were measured using a PhysioTel Digital telemetry platform (Data Sciences International). Dataquest A.R.T. software was used to acquire and analyze data. Mice were anesthetized with isofluorane. Ultrasound gel was placed on a hairless area of the chest before and echocardiography performed using a Visual Sonics Vevo 2100 system. Anesthetic depth, heart rate and body temperature were monitored throughout the procedure. Arteries were fixed with paraformaldehyde and embedded in paraffin. 5 µm thick sections were cut using a microtome and mounted on slides. Sections were de-paraffinized, blocked in BSA and incubated with H and E. Images were acquired using a transmitted light microscope (Nikon Optiphot-2) and measurements made using Stereo Investigator software (MicrobrightField, Inc.). Wall-to-lumen ratios were calculated as wall thickness/lumen diameter, where the wall (tunica media) thickness and lumen diameter of each section was the averages of four and two equidistant measurements, respectively. Retro-orbital blood was drawn from isofluorane-anesthetized mice using a Microvette Capilliary Blood Collection System (Kent Scientific Corporation). Plasma was extracted and angiotensin II (Elabscience), aldosterone (Mybiosource) and atrial natriuretic peptide (Elabscience) concentrations measured using commercially available ELISA kits and an EL800 plate reader (BioTeK). Mice were housed in individual metabolic cages for 72 hr and urine collected for the final 24 hr. Plasma and urine electrolyte concentrations were measured using the MMPC Core at Yale University. Experiments were performed using isolated mouse third-, fourth and fifth-order mesenteric arteries and first-order gastrocnemius arteries using PSS gassed with 21% O2/5% CO2/74% N2 (pH 7.4). Arterial segments 1–2 mm in length were cannulated at each end in a perfusion chamber (Living Systems Instrumentation) continuously perfused with PSS and maintained at 37°C. Intravascular pressure was altered using an attached reservoir and monitored using a pressure transducer. Luminal flow was absent during experiments. Arterial diameter was measured at 1 Hz using a CCD camera attached to a Nikon TS100-F microscope and the automatic edge-detection function of IonWizard software (Ionoptix). Myogenic tone was calculated as: 100 x (1-Dactive/Dpassive) where Dactive is active arterial diameter, and Dpassive is the diameter determined in the presence of Ca2+-free PSS supplemented with 5 mM EGTA). Isolated hindlimbs were inserted into a chamber containing gassed PSS (21% O2/5% CO2/74% N2) that was placed on a heating pad to maintain temperature at 37°C. The femoral artery was cannulated with a similar diameter glass pipette and perfused with gassed PSS at 37°C using a peristaltic pump. Perfusion pressure was measured using a pressure transducer connected to the inflow. The flow rate was increased stepwise from 0 to 2.5 mL/min in 0.25 mL/min steps to generate a response curve. Values were corrected by subtracting the pressure produced by the pipette alone at each flow rate. Prior to measuring responses to phenylephrine, flow rate was adjusted to maintain a constant perfusion pressure of 80 mmHg. Data were recorded and analyzed using IonWizard software (Ionoptix). Mesenteric artery segments (1 st and 2nd order, 2 mm in length) were mounted on tungsten wires in a multi-channel myography system (Danish Myo Technology). Chambers contained PSS that was continuously gassed with 21% O2/5% CO2/74% N2 (pH 7.4). Arterial rings were subjected to a resting tension of 10 mN and allowed to equilibrate prior to experimentation. Responses were measured to increasing concentrations of phenylephrine or 60 mM K+. Data were acquired and analyzed using LabChart software (ADInstruments). Membrane potential was measured by inserting sharp glass microelectrodes (50–90 mΩ) filled with 3 M KCl into the adventitial side of pressurized mesenteric or hindlimb arteries. Membrane potential was recorded using a WPI FD223a amplifier and digitized using a MiniDigi 1A USB interface, pClamp 9.2 software (Axon Instruments) and a personal computer. Criteria for successful intracellular impalements were: (1) a sharp negative deflection in potential on insertion; (2) stable voltage for at least 1 min after entry; (3) a sharp positive voltage deflection on exit from the recorded cell and (4) a < 10% change in tip resistance after the impalement. Isolated arterial myocytes were allowed to adhere to a glass coverslip in a recording chamber. The conventional whole-cell configuration was used to measure non-selective cation currents (Icat) by applying voltage ramps (0.13 mV/ms) between −100 mV and +100 mV from a holding potential of −40 mV. For cell swelling experiments, the pipette solution contained (in mM): Na+ aspartate 115, mannitol 50, HEPES 10, glucose 10, EGTA 1, NaGTP 0.2, with free Mg2+ and Ca2+ of 1 mM and 200 nM, respectively (pH 7.2, NaOH). Isotonic (300 mOsm) bath solution contained (in mM): Na+ aspartate 115, mannitol 50, glucose 10, HEPES 10, CaCl2 2, MgCl2 1 (pH 7.4, NaOH). Hypotonic (250 mOsm) bath solution was the same formulation as isotonic bath solution with the exclusion of mannitol (pH 7.4, NaOH). For experiments that measured ICat regulation by phenylephrine, the bath solution contained (in mM): 140 NaCl, 10 glucose, 10 HEPES, 1 MgCl2, and pH was adjusted to 7.4 with NaOH. Pipette solution contained: 140 NaCl, 10 HEPES, 10 Glucose, 5 EGTA, 1 MgATP, 0.2 NaGTP, and pH was adjusted to 7.2 with NaOH. Total MgCl2 and total CaCl2 were adjusted to give free Mg2+ concentrations of 1 mM and free Ca2+ of 200 nM. Free Mg2+ and Ca2+ were calculated using WebmaxC Standard (http://www.stanford.edu/~cpatton/webmaxcS.htm). Na+ concentration was reduced in bath solutions through equimolar replacement with N-methyl-D-glucamine. Liquid junction potentials that occurred due to a reduction in bath Na+ concentration were measured experimentally and used to correct reversal potential values measured in myocytes during voltage-clamp experiments. Briefly, liquid junction potentials were determined by measuring the immediate shift in voltage that occurred in a patch-clamp pipette containing pipette solution when bath solution containing normal Na+ concentration was replaced with one containing low Na+. Currents were recorded using an Axopatch 200B amplifier and Clampex 10.4 (Molecular Devices), digitized at 5 kHz and filtered at 1 kHz. Offline analysis was performed using Clampfit 10.4. Procedures used were similar to those previously described (Tsiokas et al., 1997). Briefly, arteries were biotinylated with EZ-Link Sulfo-NHS-LC-LC-Biotin and EZ-Link Maleimide-PEG2-Biotin. Unbound biotin was quenched with glycine-PBS, washed with PBS and then homogenized in radioimmunoprecipitation assay (RIPA) buffer. Protein concentration was normalized and biotinylated surface protein was captured by incubating cell lysates with avidin beads (Pierce) at 4°C. Proteins present in biotinylated and non-biotinylated samples were identified using Western blotting. OriginLab and GraphPad InStat software were used for statistical analyses. Values are expressed as mean ± SEM. Student t-test was used for comparing paired and unpaired data from two populations and ANOVA with Student-Newman-Keuls post hoc test used for multiple group comparisons. p<0.05 was considered significant. Power analysis was performed to verify that the sample size gave a value of > 0.8 if P was > 0.05. The Journal of Physiology 28:220–231. Pflügers Archiv - European Journal of Physiology 466:1343–1353. Journal of Biological Chemistry 279:19987–19995. Molecular and Cellular Biology 25:6980–6989. American Journal of Physiology-Heart and Circulatory Physiology 297:H1096–H1102. Journal of Biological Chemistry 277:24959–24966. Journal of the American Society of Nephrology : JASN 8:616–626. The Journal of Physiology 465:427–448. American Journal of Physiology-Cell Physiology 278:C235–C256. The Journal of Cell Biology 182:437–447. American Journal of Kidney Diseases 44:216–223. Journal of Clinical Investigation 120:3267–3279. The Journal of Physiology 591:5031–5046. American Journal of Physiology-Cell Physiology 259:C3–C18. Journal of the American Society of Nephrology 18:485–493. Journal of Clinical Investigation 109:765–775. Journal of the American Society of Nephrology : JASN 12:1–9. Pflügers Archiv - European Journal of Physiology 438:725–731. Journal of the American Society of Nephrology : JASN 10:1020–1026. Thank you for submitting your work entitled "Arterial smooth muscle cell PKD2 (TRPP1) channels control systemic blood pressure" for consideration by eLife. Your article has been reviewed by three reviewers and the evaluation has been overseen by Kenton Swartz as the Reviewing Editor and a Senior Editor. The following individuals involved in review of your submission have agreed to reveal their identity: Alexander Chesler (Reviewer #1). Although all three reviewers were somewhat divergent in their overall enthusiasm for your work, after discussion the consensus was that the characterization of the PKD2 channel in the various cell types examined was incomplete and would require considerable additional experiments to provide compelling support for the core conclusions. In particular, all three reviewers felt that more experiments would be required to better explain the different results obtained in mesenteric and hind limb smooth muscle.eLife We would be willing to consider a new manuscript if you decide to undertake the suggested experiments and the results help to resolve the issues raised by the reviewers. The manuscript by Bulley and colleagues addresses the molecular mechanisms by systemic blood pressure is regulated. Specifically, they look at the role of the TRP channel PKD2 by examining mice where the channel is knocked out selectively from smooth muscle cells in adults. As they correctly point out, there is much contradictory data about how pressure is sensed by cells in vasculature and the function of TRP channels. Here they chose to focus on PKD2 since previous studies established that it is expressed in myocytes, has been previously proposed to be a mechanosensor, and perturbing its function negatively affects myogenic tone. 1) The word "control" in the Title is far too strong an interpretation of their findings. While I agree that they help clarify PKD2's importance, the effects, although significant, highlight there clearly exist other equally important factors/mechanisms. 2) They place too much emphasis/value on the generation of mouse cross and the interpretation of their findings. While they are correct using an inducible strategy is a useful, and probably necessary approach, it is also fairly standard these days. Words like first and novel are not really appropriate and are distracting. Genotyping information does not require a figure and a fair amount of the descriptions should go into the Materials and methods section. 3) The most confusing part of the study is the differential effects of PKD2 deletion on hindlimb as compared to mesenteric arteries. This needs to be discussed and explained in greater detail. 4) How is PKD2 seemingly sensing pressure in one cell but not the other? Osmolarity is a poor proxy for pressure. Recordings using direct mechanical stimulation (Piezo-driven glass probes and/or pressure clamp recordings) should be done for both myocyte types. 5) Along this same line, are the same types of adrenergic receptors expressed in both types of myocytes? How do they explain the differential effects of PKD2 deletion on phenylephrine responses? 6) Furthermore, given they see differential effects between myocyte, where else is the SMMHC-CreERT2 expressed? Is Tamoxifen treatment equally efficient for knocking out PKD2 in all places? 7) It has become standard to show the individual data points for each bar graph so the reader can more fully appreciate the sample size, distribution and effect sizes. 8) Although they discuss TRP channels, they should also consider the roles of Piezo1 and Piezo2. Are these expressed in myocytes? Are they dysregulated after PKD2 deletion? 9) Similarly, GPCRs such as the angiotensin receptor and (very recently) GPR68 have been implicated in mechanosensing. Are these found in myocytes? Could PKD2 be functioning downstream? Some more discussion of what they think PKD2 is doing would be helpful. 10) The summary bar graphs as provided are insufficient to evaluate the sample size, distribution and effect sizes. This descriptive manuscript examines impact of smooth muscle-specific, genetic attenuation of the PKD2 gene- which encodes for the polcystin-2 ion channel- in the vascular system. Prior knowledge was limited to indiscriminate knockout of the gene in mouse models and generally focused on the renal system, where variants in PKD2 are associated with kidney cyst formation in autosomal dominant polycystic kidney disease (ADPKD). The authors use invitro and in vivo techniques to explore the mechanism of this TRP channel's putative regulation of vascular tone in response to osmotic stretch and adrenergic stimuli. Using their mouse model, among other observations they observe that conditional PKD2 knock out animals are hypotensive but they also observe seemingly conflicting results regarding how the Polycystin-2 ion channel causes this phenotype. Although not stated, there appears to be no difference in the Polycystin-2 channels constitutive activity, but the channel activity is revealed using two different stimuli that is location dependent. On one hand, PKD2/polycystin-2 in the appears to be an osmosensitive cation channel in the hindlimb artery. On the other hand, the same channel is not osmosensitive but is activated by adrenergic stimuli in the mesenteric artery. But it's difficult to see how this basic TRP gating mechanism is lost from one location to the next, and together with the incomplete electrophysiology analysis, makes me wonder if the currents they attribute to PKD2 are the same channel in both places? Thus, the conclusions need to be strengthened with the following experiments. 1) Determine if a PKD2-dependent single channel conductance can be measured from the plasma membrane and compare them from the mesenteric and hindlimb smooth muscle cells. 2) Determine if the putative PKD2 currents are cation-selective from the mesenteric and hindlimb smooth muscle. The authors used symmetric NaCl or NaAsp solutions and conclude that this channel is Na-permeable or is "cation-selective" without demonstrating this, as either anion can permeate chloride channels in smooth muscle (PMID: 10087337). This is particularly important for the osmo-regulation experiments, as the 300-250mOs condition invariably causes an increasing in the ohmic leak currents and likely activates resident swell-activated Cl- channels. 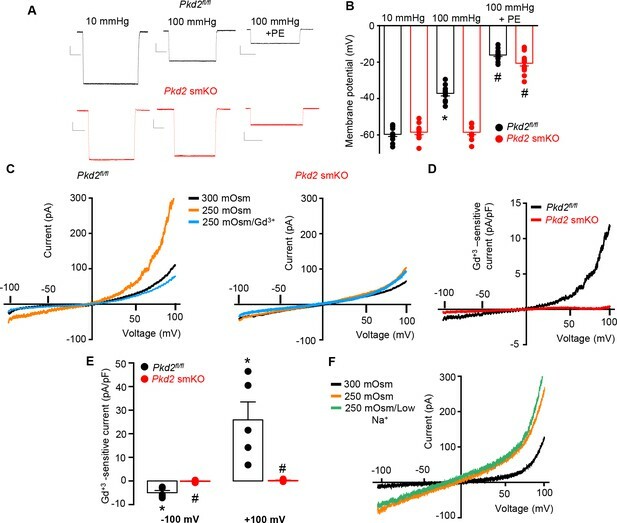 3) The reversal potentials and voltage-dependence are variable between the electrophysiology recordings that report the putative PKD2 channel activity. Thus, uniform steady state analysis of the current should be per An example of this is Figure 4 —figure supplement 1and Figure 6—figure supplement 1. In Figure 6—figure supplement 1the reversal potential shifts from approximately -10 mV to +10 mV between the knockout and control currents (respectively), but it is zero millivolts experiments under the same conditions. Perhaps there are differences in the relative ion permeability of these cell membranes, that is variable from cell to cell, but cannot be considered a pure PKD2 current. Whether hypertension in ADPKD is a primary vasculopathy secondary to mutations in the polycystin genes or perhaps, secondary to activation of the renin-angiotensin-aldosterone system by cyst expansion and intrarenal ischemia is unclear and thus is an intriguing question. However, it is important to point out that hypertension, not hypotension (as observed in their mouse) is associated with ADPKD in man. Thus, while the findings are descriptive of PKD2 regulation of vascular tone, it does little to enhance our understanding the disease complications associated with this channel. The results from the bar graphs should be enumerated on an excel file. The mouse model is interesting and experiments employing it provide compelling evidence to support a role for smooth muscle PKD2 in blood pressure regulation. This facet of the current manuscript is novel and by far the best developed. On the other hand, findings related to differential stimulus-sensitivity of PKD2 in hindlimb arteries (pressure-induced tone) and mesenteric arteries (PE-induced construction) are puzzling and leaves one hanging. There is an unsatisfying lack of a physiological rationale for this outcome. Which one is related to blood pressure regulation, or are both, and which one is more important? How would you prove this? Having said that, the effects of smooth muscle PKD2 on blood pressure regulation are striking and convincing. The effects of smooth muscle deletion of PKD2 on pressure and PE-induced increases on blood vessel diameter are convincing. The effects on membrane current are incomplete and not convincing. In my view, the authors could turn this manuscript into a compelling study, without much experimentation, with a much more balanced and nuanced presentation. For example, stressing the importance and novelty of the role of smooth muscle PKD2 in blood pressure regulation, and using the effects on myogenic and PE-induced tone as possible connectors while discussing the uncertainties of the connections. 1) Introduction: The motivation and rationale for the study are not well-developed. For example, in the first paragraph, it is stated "However the molecular identity of arterial myocyte ion channels that regulate blood pressure, and their mechanisms of modulation in vivo (are) poorly understood." This is not entirely true. L-type voltage-dependent calcium channels in vascular smooth muscle regulate blood pressure and are the targets of a major class of anti-hypertensive drugs. Furthermore, the "in vivo" modulation of any type of ion channel is not completely understood. The current study only sheds light on PKD2 modulation in vitro, and not in vivo. 2) Introduction and elsewhere: It is stated a number of times that the PKD2 knockout is in "systemic artery myocytes". This not true; it is all smooth muscle (vascular and non-vascular). This should be made clear. Do the mice have any other defects? 3) Subsection “Swelling activates PKD2 channels in hindlimb artery myocytes”: Cell-swelling-based electrophysiology data are incomplete. The authors show that cell swelling stimulates a TRP-like current in hindlimb artery myocytes, consistent with the demonstration that PKD2 plays a role in a mechanosensitive response (pressure-induced constriction) in hindlimb arteries. Although they report that PKD2 is not involved in pressure-induced constriction in mesenteric arteries, whether swelling-induced TRP-like currents are absent or present in myocytes from these arteries is not tested. 4) It is unclear why isotonic Na+ was used. A physiological solution could have been used, so that swelling-activated (Na+) current over physiological membrane potentials can be examined. Furthermore, a similar protocol was used by Welsh et al., 2002, with the conclusion that the cation current was through TRPC6 channels. This study should be discussed. 5) Results section: PE-based electrophysiology data are incomplete. The authors show that PE stimulates a TRP-like current in mesenteric artery myocytes, consistent with the demonstration that PE induces constriction of mesenteric arteries. The companion patch-clamp experiments (PE on hindlimb artery myocytes) are nowhere to be found. Since other TRP channels are present in these cells (at minimum, TRPM4, TRPC6 and TRPV4, according to their own presentation) and should be detectable under these conditions, this result is puzzling. 6) Not at all clear why PKD2 KO should have a dramatic effect on myogenic tone in hindlimb (and cerebral arteries) arteries, but no effect at all in mesenteric arteries. Seemingly inexplicable results are often the takeoff point for interesting scientific stories, but they are intellectually unsatisfying if left hanging, as they are here. Again, at first blush, it makes no sense that PKD2 KO would have a dramatic effect on PE effects in mesenteric arteries, but no effect in hindlimb arteries. Thank you for submitting your article "Arterial smooth muscle cell PKD2 (TRPP1) channels regulate systemic blood pressure" for consideration by eLife. Your article has been reviewed by three peer reviewers, and the evaluation has been overseen by Kenton Swartz as the Reviewing Editor and Richard Aldrich as the Senior Editor. The reviewers have opted to remain anonymous. This comprehensive study provides compelling evidence that arterial smooth muscle PKD2 (TRPP1) channels regulate blood pressure through transducing intravascular pressure (hindlimb) or sympathetic simulation into vasoconstriction. This is accomplished using a new inducible, smooth muscle-specific knockout of PKD2. The mystery of differential sensitivity of PKD2 to different stimuli remains to be explored and will be interesting to unravel. All in all, the authors have done an admirable job of revising the manuscript in response to the initial review. 1) The representative traces in Figure 4C can be confusing when compared to the Gd-sensitive currents plotted in Figure 4D. Please show traces for Gd for both conditions studied in Figure 4C and explicitly point out in the text what is shown in Figure 4C and D. Also, the graphs in Figures 4D and Figure 4—figure supplement 1B are confusing because only data for -100 and +100 are shown, yet they appear on a continuous x-axis labeled voltage. The x axis should be removed, and data plotted at bar graphs with conditions clearly labeled. 2) It appears that some of the changes made in revision were done hastily, as there are ambiguous statements and grammatical errors in the red text. For example, these lines from the methods are non-sequiturs "Equimolar N-methyl-glucamine (NMDG) was substituted for Na+. Liquid junction potential was measured experimentally." Substituted for which solution? What was the LJ potential then if it was measured and what was done with that measurement? Please take your time revising the text and figures to make sure everything will be clear to readers. Thank you for resubmitting your work entitled "Arterial smooth muscle cell PKD2 (TRPP1) channels regulate systemic blood pressure" for further consideration at eLife. Your revised article has been favorably evaluated by Richard Aldrich (Senior Editor) and Kenton Swartz as the Reviewing Editor. Your revised manuscript has addressed our specific requests of the reviewing editor and reviewers. However, in evaluating the full manuscript it became evident that the conceptual problem you have nicely corrected in Figure 4E of the revised manuscript needs to also be applied to Figure 4—figure supplement 1, Figure 6D and Figure 6—figure supplement 1. We request that you make the appropriate changes to those remaining figures before publication. […] 1) The word "control" in the Title is far too strong an interpretation of their findings. While I agree that they help clarify PKD2's importance, the effects, although significant, highlight there clearly exist other equally important factors/mechanisms. As suggested, we have modified the Title. We have removed all but one of these terms from the manuscript. We consider the mouse model generated here to be important step in the study of arterial smooth muscle TRP channels. Therefore, we retained one reference (in the abstract) to this paper being the first study to develop an inducible, cell-specific knockout of a TRP protein. As suggested, we have removed Supplemental figure 1, which was a schematic illustrating the generation of the mouse model, breeding strategy and the genotyping approach. More of this information is now discussed in the Materials and methods section. We have expanded the text in the sixth paragraph of the Discussion section to explain why PKD2 channels may be regulated by different stimuli in arterial myocytes of different organs. Arteries of diverse organs are exposed to unique environments, including range of intravascular pressures and the types and concentrations of vasoconstrictor and vasodilator stimuli that regulate contractility. It would be surprising if the molecular components of signaling pathways were identical in myocytes of different arteries, including those in the mesentery and hindlimb. The goal of our study was to test the hypothesis that an arterial myocyte TRP channel regulates systemic blood pressure. We show that vasoconstrictor stimuli activate PKD2 channels in arterial myocytes, leading to Na+ influx, membrane depolarization, vasoconstriction and an elevation in blood pressure. It is not clear what the most appropriate stimulus is to apply to an isolated smooth muscle cell to simulate intravascular pressure in an artery where myocytes are positioned in cylindrical orientation. Cell swelling has been used as a standard method in many publications to stimulate mechanosensitive responses arterial myocytes. Swelling has been successfully demonstrated to activate currents, including non-selective cation and chloride currents, in myocytes. In these studies, the same channels activated by cell-swelling contributed to pressure-induced vasoconstriction, suggesting that osmolarity is a good proxy for pressure in isolated arterial myocytes. We used the same approach here and show that cell-swelling activates a Na+ current in hindlimb artery myocytes of PKD2fl/fl mice but does not activate the same current in hindlimb artery myocytes of inducible, smooth muscle cell-specific PKD2 knockout mice. These results are supported by extensive data obtained using the best possible proxy for pressure, which is pressure itself, and show that pressure-induced depolarization and vasoconstriction in hindlimb arteries and perfusion pressure in intact hindlimb muscle are all attenuated in PKD2sm-/- mice. Furthermore, we show using telemetry that PKD2 knockout reduces systemic blood pressure in conscious mice. We consider that this combination of approaches strongly supports our conclusion that pressure stimulates PKD2 channels in arterial myocytes. It is unclear what is the best approach to use to simulate the force produced by intravascular pressure in an intact artery when studying an isolated arterial myocyte situated in a patch-clamp chamber. It is not known whether applying suction to cell-attached patches or pressing piezo-driven glass probes onto isolated myocytes are better proxys for intravascular pressure than cell swelling. To attempt to determine whether an alternative method to cell swelling also stimulates PKD2 channels in arterial myocytes, we performed patch-pressure experiments, similarly to what we did previously for TMEM16A channels in cerebral artery myocytes1. We also used glass probes. We found that applying patch pressure did activate single non-selective cation channels in hindlimb artery myocytes of PKD2fl/fl mice, although this only occurred in a small percentage (3/30 = 10% ) of cell-attached patches. Given that the surface area of a cell-attached patch is ~1 µm2 and that of an arterial myocyte is ~3141 µm2 (assuming a 10 µm diameter cylinder that is 100 µm long), this low probability of obtaining channels within small membrane patches is not surprising. Because of the low probability of obtaining a patch containing channels, we would have to record from a very large number of patches (at least 100) to obtain sufficient data to analyze channel properties in PKD2fl/fl myocytes. We would then be required to record from a similarly large number (again at least 100) of PKD2sm-/- myocytes to determine whether the same pressure-activated single channel conductance is absent in the knockout, confirming that it is PKD2. We consider this amount of experimentation beyond the scope of the current study, particularly as we show that swelling-included Na+ currents, pressure-induced depolarization, pressure-induced vasoconstriction, muscle perfusion pressure, and systemic blood pressure are all attenuated in myocytes, arteries, whole hindlimb and in vivo circulation of PKD2sm-/- mice. We also attempted to measure current regulation by piezo-driven glass probes, but encountered technical challenges related to the fact that we record from fresh-isolated, myocytes that do not strongly adhere to the glass coverslip in the patchclamp chamber. When we applied pressure to myocytes using a glass probe, the cells rolled, which is not unexpected given their cylindrical shape. This rolling will produce large variability in the amount of pressure applied to individual cells. While we consider that glass probes may be useful for future studies, there will be significant technical challenges that need to be overcome before such an approach can be used reproducibly for arterial myocytes. We consider that at present this is also beyond the scope of the current study. We trust that you consider the wide variety of cellular, whole artery, intact tissue and in vivo approaches we have used to support our conclusions that PKD2 channels contribute to pressure-induced vasoconstriction in hindlimb arteries. We also hope you recognize that major technical challenges exist with your request, making it beyond the scope of the current study. We have performed new experiments and now show that adrenergic receptor subtypes 1A, 1B and 1D are similar in mesenteric and hindlimb arteries of PKD2fl/fl and PKD2sm-/- mice (new Figure 1—figure supplement 3). These data indicate that the differential effects of PKD2 knockout in each artery type cannot be explained by changes in the expression of adrenergic receptors. We have performed additional immunofluorescence and contractility experiments. We now demonstrate that PKD2 is present in hindlimb artery myocytes of PKD2fl/fl mice, but absent in hindlimb artery myocytes of PKD2sm-/- mice (new Figure 1D). 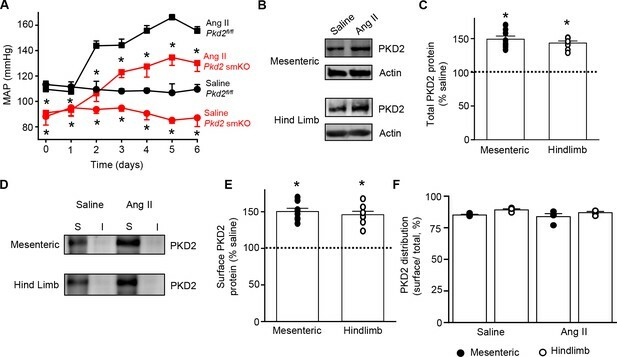 These data compliment those provided in the first submission which showed that PKD2 is knocked out in mesenteric artery myocytes of PKD2sm-/- mice. We also now show that phenylephrine similarly constricts hindlimb arteries of PKD2fl/fl and PKD2sm-/- mice (new Figure 3—figure supplement 1C). These data provide additional support for our conclusion that α1 adrenergic receptors do not signal through PKD2 channels in myocytes of hindlimb arteries. We agree and now show the individual data points on all bar graphs. There is evidence for Piezo1 expression in arterial myocytes, although Piezo1 is not required for the myogenic response in caudal and cerebral arteries2. 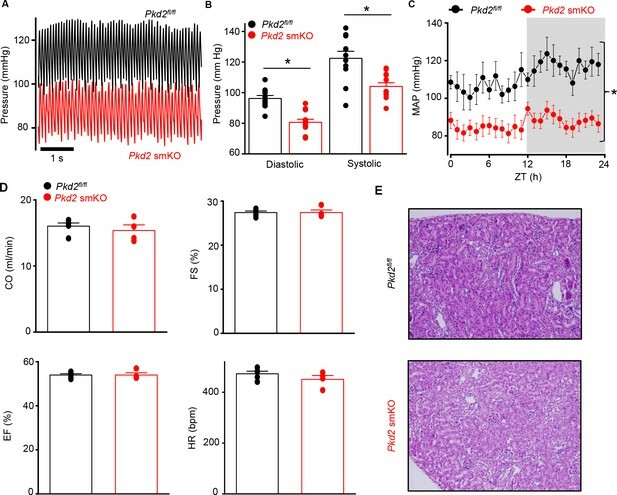 We have performed additional experiments and now show that Piezo1 protein is similar in mesenteric and hindlimb arteries of PKD2fl/fl and PKD2sm-/- mice (new Figure 1—figure supplement 3). These data suggest that the attenuated pressure induced vasoconstriction in PKD2sm-/- hindlimb arteries cannot be explained by changes in Piezo1 expression in myocytes. These new data and evidence for Piezo1 expression in arterial myocytes have now been discussed in the manuscript. We include new data and now show that GPR68 and angiotensin II receptor proteins are similar in mesenteric and hindlimb arteries of PKD2fl/fl and PKD2sm-/- mice (new Figure 1—figure supplement 3). We have expanded the Discussion section to describe evidence that these proteins are mechanosensors in smooth muscle and the possibility that PKD2 channels may be downstream effectors. As suggested, individual data points are now shown on all bar graphs. […] 1) Determine if a PKD2-dependent single channel conductance can be measured from the plasma membrane and compare them from the mesenteric and hindlimb smooth muscle cells. The goals of the study were to test the hypothesis that arterial myocyte PKD2 channels regulate systemic blood pressure and to investigate mechanisms involved. The measurements you suggest would aim to determine whether the single channel conductances of swelling-activated channels in hindlimb artery myocytes and phenylephrine-activated channels in mesenteric artery myocytes are similar or different. To be certain that single channels which are measured are PKD2, we would need to show that these specific single channel conductances are absent in PKD2sm-/- myocytes from each artery type. To attempt to directly address your question, we performed patch-pressure experiments in hindlimb artery myocytes using similar approaches to those we used to measure single TMEM16A channels in cerebral artery myocytes1. We found that negative pressure activated single non-selective channels in PKD2fl/fl myocytes, although this only occurred in a small percentage (in 3 out of 30 = 10% ) of cell-attached patches. Given that the plasma membrane surface area of a cell-attached patch is ~1 µm2 and that of an arterial myocyte is ~3141 µm2 (assuming a 10 µm diameter cylinder that is 100 µm long), the low probability of obtaining pressure-sensitive channels within individual patches is not surprising. However, this creates technical challenges with performing the experiments you suggested. Because of the low probability of obtaining pressure-sensitive channels in patches, we would have to record from a very large number of both hindlimb artery and mesenteric artery myocytes (~100 of each type) to obtain sufficient recordings to characterize channel properties. We would also need to record from an equally large number of hindlimb artery and mesenteric artery myocytes of PKD2sm-/- myocytes to determine whether the same single channel conductances are absent. Other challenges exist. PKD2 knockout only partially attenuated phenylephrine-induced vasoconstriction, indicating that PKD2 channel activation is only one mechanism activated by this vasoconstrictor. Phenylephrine is likely to activate several different ion channel types in myocytes through Gq11 and via the release of intracellular Ca2+, which will stimulate Ca2+-activated channels. Phenylephrine-induced simultaneous activation of multiple different ion channel types that have different conductances will make it difficult to identify individual openings of PKD2 channels. We consider this extensive identification of single channel conductances in hindlimb and mesenteric hindlimb artery myocytes of PKD2fl/fl and PKD2sm-/- myocytes from two different artery types that are activated by distinct stimuli to be well beyond the scope of the current study. We also believe that this information does not alter the principal conclusions of our paper that arterial myocyte PKD2 channels increase systemic blood pressure by activating Na+ currents that induce membrane depolarization and vasoconstriction. Considering the large amount of work that would be involved, we consider that a future, focused study should compare the single channel properties of PKD2 channels in myocytes of different arterial beds. As suggested, we have performed new experiments. We now show using cation substitution that cell swelling activates a Na+ current in hindlimb artery myocytes and phenylephrine stimulates a Na+ current in mesenteric artery myocytes (new Figure 4 and Figure 6). Current activation by these stimuli is absent in the same arterial myocytes of PKD2sm-/- mice. These data provide further support that swelling activates PKD2 channels in hindlimb artery myocytes and phenylephrine stimulates PKD2 channels in mesenteric artery myocytes, generating Na+ currents. The inclusion of these new data made previous Figure 4F and 4G redundant, so they were removed. Please refer to our response to your previous comment (#2) and see our new data where have performed Na+ substitution experiments and report current reversal potentials (new Figure 4 and Figure 6). Mean reversal potentials in mesenteric and hindlimb artery myocytes of PKD2fl/fl and PKD2sm-/- mice are not different. Collectively, data show that PKD2 channel activation generates Na+ currents in arterial myocytes that induce membrane depolarization, vasoconstriction and an increase in systemic blood pressure. 4) Whether hypertension in ADPKD is a primary vasculopathy secondary to mutations in the polycystin genes or perhaps, secondary to activation of the renin-angiotensin-aldosterone system by cyst expansion and intrarenal ischemia is unclear and thus is an intriguing question. However, it is important to point out that hypertension, not hypotension (as observed in their mouse) is associated with ADPKD in man. Thus, while the findings are descriptive of PKD2 regulation of vascular tone, it does little to enhance our understanding the disease complications associated with this channel. We have expanded the paragraph in the Discussion section to consider these points in more detail. The goal of our study was to investigate blood pressure regulation by arterial myocyte PKD2 channels. One finding of our paper is that inducible, smooth muscle cell-specific PKD2 channel knockout reduces systemic blood pressure. Regarding disease complications associated with this channel, we show that PKD2 is upregulated in hypertension and that smooth muscle-specific knockout causes vasodilation and reduces arterial wall remodeling and hypertension. We respectfully disagree that or study does little to enhance our understanding of disease complications associated with this channel. It was not our objective to study ADPKD or pathological effects of ADPKD-associated PKD2 channel mutations in arterial myocytes. Our demonstration that myocyte PKD2 channels regulate blood pressure is a step forward to better understanding the significance of this myocyte ion channel in cardiovascular physiology and disease. As we discussed in the paper and as you point out, a constitutive and global PKD2 channel mutation is associated with hypertension in ADPKD patients. Here, we studied the effects of knocking out arterial myocyte PKD2 over an approximately three week time period in fully developed adult mice. There are many reasons for why an acute, myocyte-specific PKD2 knockout model and a constitutive and global PKD2 mutation have different effects on blood pressure. We refer you to our expanded Discussion section, where we have outlined these considerations in more detail. Briefly, these include differences that may occur when studying PKD2 mutations versus PKD2 knockout, global versus myocyte-specific effects, and the result of a constitutive mutation that is present since fertilization versus those of an acute (<3 week) knockout in fully developed adults. Future studies should be designed to investigate the effects of PKD2 mutations that occur in ADPKD patients on vascular myocyte function and systemic blood pressure. […] 1) Introduction: The motivation and rationale for the study are not well-developed. For example, in the first paragraph, it is stated "However the molecular identity of arterial myocyte ion channels that regulate blood pressure, and their mechanisms of modulation in vivo (are) poorly understood." This is not entirely true. L-type voltage-dependent calcium channels in vascular smooth muscle regulate blood pressure and are the targets of a major class of anti-hypertensive drugs. Furthermore, the "in vivo" modulation of any type of ion channel is not completely understood. The current study only sheds light on PKD2 modulation in vitro, and not in vivo. We have modified this paragraph to better outline the rationale for the study. As suggested, these statements have been modified to improve clarity. The mice do not have any obvious defects other than those described in the paper. Locomotion, cardiac function, plasma angiotensin II, aldosterone and ANP and plasma and urine electrolytes were all similar in PKD2fl/fl and PKD2sm-/- mice. These data were provided in the first submission of the manuscript as supplemental figure 8. Due to figure rearrangement in the revised manuscript, these data are now shown as Figure 6—figure supplement 1. These results indicate that cell swelling activates a similar amplitude ICat in mesenteric artery myocytes of PKD2fl/fl and PKD2sm-/- mice. The goal of the study was to investigate the regulation of blood pressure by PKD2 channels, which are non-selective cation channels. Isotonic Na+ was used to isolate currents through TRP channels and to prevent currents through K+ channels. We have performed additional patch-clamp experiments to measure the permeability of the swelling-activated current. These new data show that hypoosmolar solution activates a Na+ current (new Figure 4). As suggested, we have discussed the Welsh study, which demonstrated that myocyte TRPC6 channels contribute to the myogenic response in cerebral arteries, a vascular bed that does not regulate systemic blood pressure. These data are now shown as Figure 4—figure supplement 1. They show that phenylephrine activates a similar amplitude ICat in hindlimb artery myocytes of PKD2fl/fl and PKD2sm-/- mice. We have also performed additional new experiments and show that phenylephrine similarly constricts hindlimb arteries of PKD2fl/fl and PKD2sm-/- mice (new Figure 3—figure supplement 1C). These data provide additional support for our conclusion that α1-adrenergic receptors do not signal to PKD2 channels in myocytes of hindlimb arteries. We have expanded the text and provide multiple explanations why unique stimuli may activate PKD2 channels in myocytes of different arteries. Arteries within different organs are exposed to unique environments, including diverse intravascular pressures and the types and concentrations of a wide range of vasoconstrictor and vasodilator stimuli. Arteries of different organs are not the same. Clear examples include cerebral, pulmonary and coronary arteries. It would be surprising if the molecular components of signaling pathways were identical in myocytes of different arteries. The goal of our study was to investigate blood pressure regulation by arterial myocyte PKD2 channels. We found using a knockout model that the same ion channel, PKD2, is activated by distinct vasoconstrictor stimuli in two different vascular beds. It was not a goal of our study to identify the differential signaling mechanisms involved in PKD2 activation in these different vascular beds. As you mention, we consider this finding to be a “takeoff point” for future studies and well beyond the scope of the current manuscript. 1. Bulley S, Neeb ZP, Burris SK, Bannister JP, Thomas-Gatewood CM, Jangsangthong W and Jaggar JH. TMEM16A/ANO1 channels contribute to the myogenic response in cerebral arteries. Circ Res. 2012;111:1027-1036. In Figure 4, we have included a new panel illustrating representative traces for Gd3+-sensitive currents in hypotonic solution in Pkd2fl/fl and Pkd2 smKO myocytes (Figure 4D). We have referred to this figure in the Results section and the figure legend. In Figure 4E (previously 4D), the x-axis has been removed from Figure 4E and the y-axis moved to the left for better visibility. The y-axis in Figure 4—figure supplement 1B has also been moved to the left of the graph. We have made sure there are no grammatical errors or ambiguous statements in the text. In the Materials and methods section and Results section, we have described how liquid junction potentials were measured and used to correct reversal potential values recorded in patch-clamp experiments. The results for the liquid junction potential measurements are now in the Results section. As requested, we have modified the format of the graphs shown in Figure 4—figure supplement 1, Figure 6D and Figure 6—figure supplement 1 to match that of the graph shown in Figure 4E. These new figures have been uploaded. This study was supported by NIH/NHLBI grants HL67061, HL133256 and HL137745 to JHJ, American Heart Association (AHA) Scientist Development Grants to SB and MDM and AHA postdoctoral fellowship to RH. Studies utilized resources provided by the NIDDK-sponsored Johns Hopkins Polycystic Kidney Disease Research and Clinical Core Center, P30 DK090868. Animal experimentation: This study was performed in strict accordance with the recommendations in the Guide for the Care and Use of Laboratory Animals of the National Institutes of Health. All of the animals were handled according to an approved institutional animal care and use committee (IACUC) protocol (#17-068.0) of the University of Tennessee. Every effort was made to minimize suffering. © 2018, Bulley et al.